Well, I’m back from Hotel Southmead in Bristol feeling pretty good at the moment. 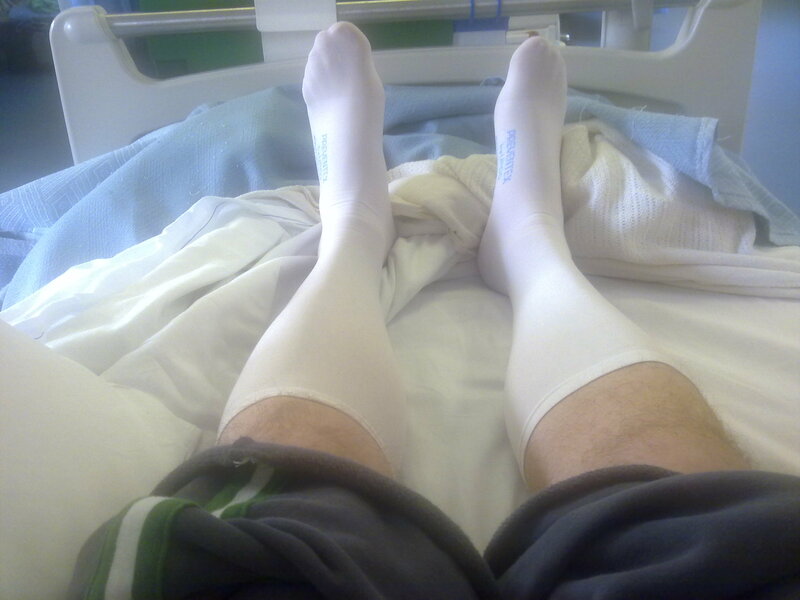 I went in to hospital on the Wednesday afternoon as my operation was scheduled for 8.30am the following morning. It was a farely restless night as you can imagine but the morning came round quite quickly and I was visited by my surgeons registrar to go through the formalities before the op. Whilst we were talking, all the lights went out in the hospital and then straight back on again. He joked with me about it not being a good sign and it appeared he was right. A builder in the area had managed to cut through a major electric cable and forced the hospital on to its emergency generator!! Great. Although it would have been safe to carry on with the op the policy is, and quite rightly so, that all operations would be put on hold until the main power was back up and running. 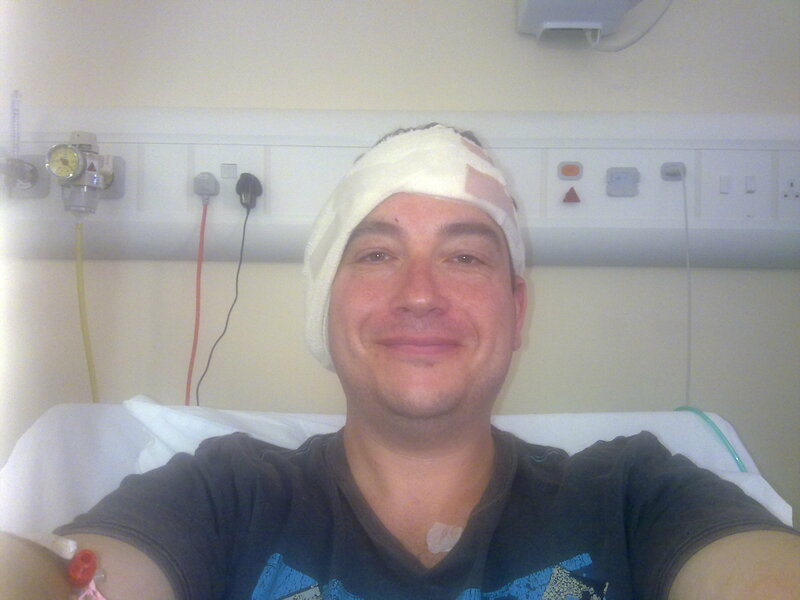 Well after another 4 hours of waiting I finally got taken down to theatre and before I could say anything other than ‘ make sure you do my right ear! !’ I was waking up in recovery wondering if they had actually done anything. Then I felt my head and realised that it was all over. Nice! The whole thing was filmed by the BBC and took about 3 hours. 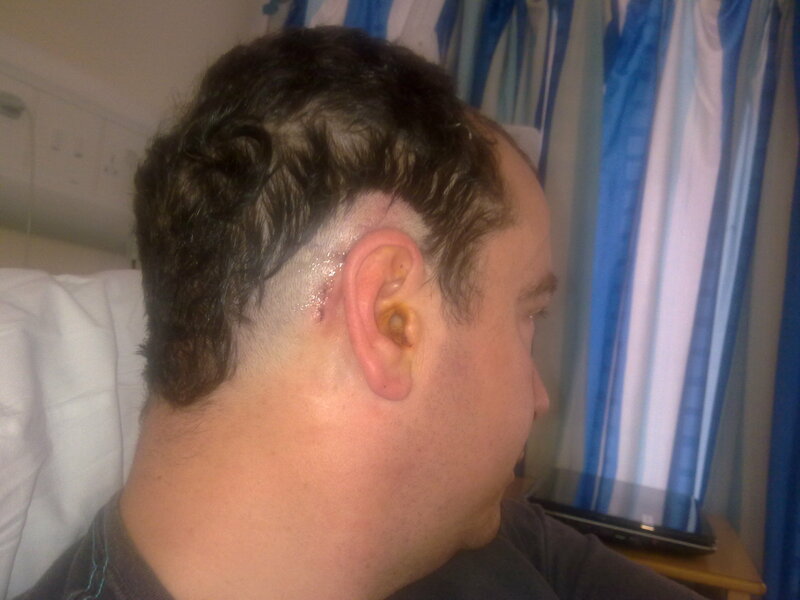 My surgeon was very happy with the results and I was informed the next morning that the they had managed to insert the electrodes the whole way into my cochlear, that all the electrodes were working and my inner ear was already being stimulated ready for sound on my switch on, in about 4 weeks time. How do I feel now? Well, the pain is fine. Nothing a few pain killers wont cure. My neck and jaw are a bit stiff but considering I have had a whole drilled into my skull I’m pretty amazed at the lack of pain. Not that I want anymore!!! I’m not complaining!! The worst thing, apart from the tights they make you wear, has been the tinnitus, which is way worse and sounds like a train rumbling through my head. My balance has been a little dodgy but that is improving after every little sleep I have. Just need to remember to move slowly!! I have been told that I do not need to go back again until my actual switch on appointment so now it’s a question of sitting back and recovering and waiting for that switch on appointment to come through the post. Great news Graham! So it all went well in the end. Nice hospital gear you have there. Is that a TV I see behind you? We don’t have those in London 😦 Look forward to your activation report. Ha ha. Yeah it is a TV, radio, internet etc but you have to stick your credit card in to make it work!!! It was a nice hospital……..and will be even nicer once the building work is finished. All the staff were great and couldn’t do enough for me. Cheers Fiona. Yeah I’m amazed I feel ok. The odd sharp pain but only for a second then it goes. Hey Graham, wow, im amazed how good your feeling, considering your a bloke and they moan a lot about pain! TEE HEE 🙂 Im not worried at all now. Was yer tinnitus bad before the op? Just got to be patient and wait till your all healed, then the fun begins. Cant wait to read about how it all goes for you. Congrats at getting through the operation in one piece. Will you watch yer own op?? have a good, well deserved, rest. Hi Soozie. Cheeky. I don’t ever get man flu or complain about pain!! Though my wife would say different!! 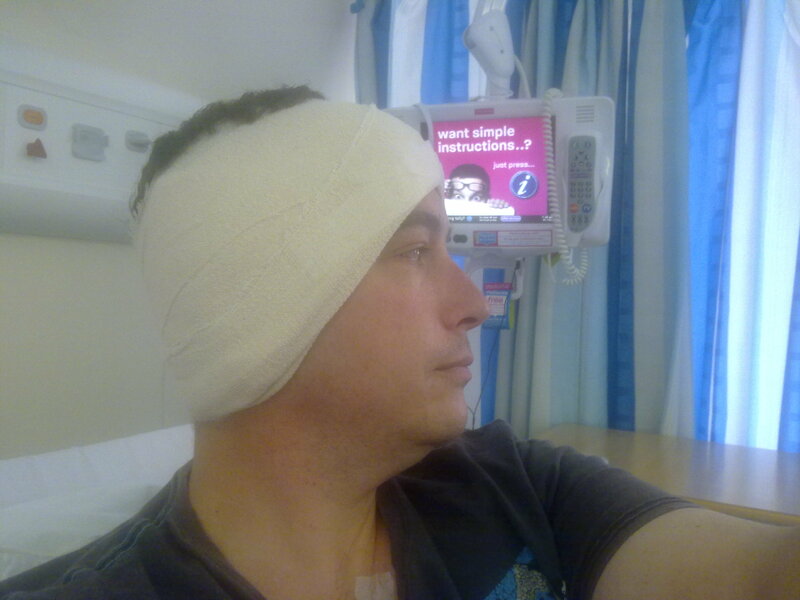 Tinnitus was ok before op………always there and had bad days and good days but now it is loud all the time. I was warned about this and expect it to drop again over the next few days. The rumbling train noise in less often shall we say. I will def watch my own op. The camera man said he was surprised he didn’t faint!! Ha ha. Hotel Southmead is indeed a four-star establishment – TV, great staff, late night bikkies! Did you get to sample the chocolate sponge?? I got extra custard, the nurses were so nice! I know I keep banging on about it, but it was the highlight of my stay!! The CI was incidental (grins). And when they interrupted my breakfast to take my BP etc. they asked me if I’d like fresh hot toast. Now THAT’s service! glad the op went well. will be watching when it comes to SeeHear! Your activation day will soon come round! Cheers Laura……Activation on 9th June!! 3 weeks today !! Great pics – and def bought back memories of when I had mine done! Southmead is a nice place despite all the building work going on!! Glad to hear the op went well despite being delayed! How long was it? My first one (in 2001) took 5 and half hrs, then the re -implant op was only 2 and half hrs (expected to be much quicker as all drilling was done). So…. hope you are feeling OK and not too dizzy! tinitus (forgot about that!) does subside over time – and def will go when you’re switched on. Its normal……..have you got any stitches or are they dissolvable? Was amazed/suprised at how small your scar was and they hardly shaved any hair away – lucky you! Mine was 2-3 times bigger than yours (up the side of the head) and more was shaved away! Mr Robinson’s surgical & barber skills must’ve improved a lot since I had mine 9 yrs ago. (did have a re-implant op when it all failed 4 yrs ago – but they re-opened same scar etc). Hopefully you’ll get a date for your switch on soon I(do you know who’s doing it?) – I had my date within 1-2 wks after coming out of hosp. can’t wait to see it all on See Hear! Hi Alison. I did fear it would be cancelled too!! He seems to have done a good tidy job. It took 3 hours including stopping to talk to the camera!! All my stitches are internal and dissolvable. The outer skin has been glued!! Clever stuff. I didn’t get a copy of my x-ray but I did see it with a doctor on the computer. He said it looked a good way in and nicely curled round the cochlear. That’s good enough for me. I was really dizzy for the first couple of days but only if I moved from lying down to standing. I am fine now. All I get now is the tiredness (something to do with 2 young children maybe!) and the odd stabbing pain in my head. Nothing a few pain killers cant cope with though. The tinnitus has subsided a bit which is better but it hasn’t helped having a bit of a cold. I shall be following this with interest. Im considering having an implant myself as most of my hearing has now been destroyed via menieres. Hi Clive. My switch on is 3 weeks today (9th June) and it will be on the telly in Sept time etc. Sorry about you menieres. No idea what that is like but cant be nice for you. If you check out my links down the side you can check out other CI users blogs and also the link to my showing on See Hear. I hope all the info I have written about can be of some help to you. I’ll look forward to watching you again on telly. You’re going to be famous! ha ha ( already seen you on See hear ). Yes, I’ll check out all the CI blogs and ask lots of questions during my process. forgive me you’re Graham, not Brian 🙂 so sorry!!! !